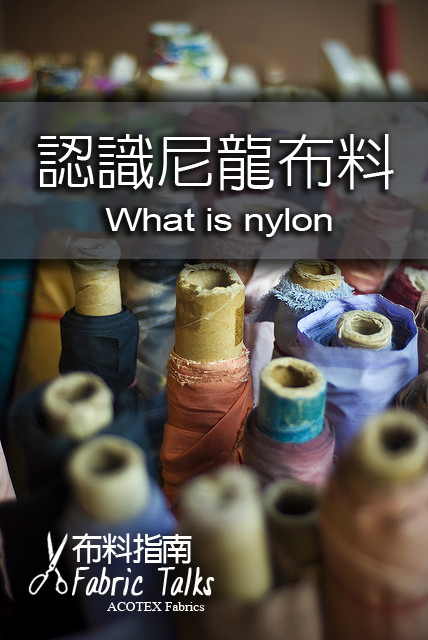 ACOTEX® 服裝布料知識網 - 認識尼龍布料 | What is Nylon? 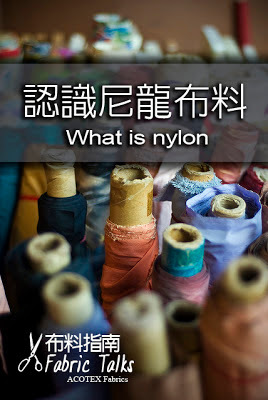 Home » Fabric Talks 布料指南 » 認識尼龍布料 | What is Nylon? Nylon is a synthetic fabric made from petroleum products, and is among the many polymer products in common daily use throughout the world. It is the second most used fiber in the United States, since it is so versatile and relatively easy to make. Like most petroleum products, it has a very slow decay rate, which unfortunately results in the accumulation of unwanted products in landfills around the world. Nylon is made through a chemical process called ring opening polymerization, in which a molecule with a cyclic shape is opened and flattened. Other forms of the material are made through the chemical reaction between two monomers: adipoyl chloride and hexamethylene diamine. When stretched, the fibers even out, thin, and smooth until they reach a point at which they have no more give, yet are still very strong. 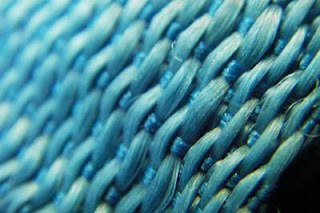 After nylon is extruded in a thread form, therefore, it is drawn or stretched after it cools to make long, even fibers. Before drawing, the material has a tangled structure, which straightens out into parallel lines. The strength of nylon comes from amide groups in its molecular chain, which bond together very well. It also has a very regular shape, which makes it well suited to creating fabrics designed to stand up to intense forces. In fact, it was the primary material used in parachutes and ropes during World War II for this reason. It is also used for bulletproof vests and other hard wearing items. Nylon is very sensitive to heat and should be washed and dried on cool settings. The fabric can also be hung dry, and it is favored by campers because it dries very quickly. It's a flexible textile, and as a result, it appears in a wide range of applications, from clothing to climbing equipment. Depending on how it is processed, nylon can be formed into the gossamer-like threads used in stockings or into thick toothbrush bristles. Nylon is very much suitable for hosiery and the knitted fabrics because of its smoothness, light weight and high strength. Nylon is a lustrous fibre. The lustre of the fibre can be modified by adding the delustering agent at the molten stage. Composition: The nylons are polyamides with recurring amide groups. They contain carbon, oxygen, nitrogen and hydrogen elements. Strength: Nylon has good tenacity and the strength is not lost with age. Nylon has a high strength to weight ratio. It is one of the lightest textile fibres is at the same time also one of the strongest. It is one of the fibres which are added at the points of wear such as knees and seats of jeans and toes and heels of socks. The strength of the nylon fabric is lost when wet. Nylon has excellent abrasion resistance. Elasticity: Nylon has good elasticity which makes it much suitable for the apparel purposes. The excellent elasticity would mean that the nylon materials return to their original length and shreds the wrinkles or creases. Nylon like other fibres has its own limit of elasticity. If stretched too much, it will not completely recover its shape. The high elongation and excellent elastic recovery of nylon contributes to the outstanding performance in hosiery. Nylon hosiery recovers to its original shape at knees and ankles instead of bagging. Resilience: Nylon fabrics have excellent resilience. Nylon fabrics retain their smooth appearance and the wrinkles from the usual daily activities can be removed easily. Drapability: Fabrics of nylon filament yarn have excellent draping qualities. The drape of the fabrics made from nylon can be varied depending on the yarn size. The light weight sheer fabrics of nylon night gowns have high-draping quality. The medium-weight dress fabrics can drape very nicely. Heat Conductivity: The heat conductivity of the nylon fabrics vary depending upon the fabric construction, the type of nylon (staple/filament) used in the construction etc. For instance, the filament nylon used in the open construction would be cooler when compared to the same filament used in a closed construction. In a closed or tight construction the air circulation through the fabric is limited. The heat and moisture of the body will not readily pass the fabric construction, which makes the wearer feel very warm. Such fabrics are good for winter apparel, such as wind-breakers, but are not suitable for summer garments. On the other hand the fabrics with open construction permits the air circulation which makes the wearer feel cool. Absorbency: Nylon fabrics have low absorbency. The low absorbency of the fabrics tends to be advantageous and also disadvantageous. The main advantage of the nylons low absorbency is that the water remains on the surface of the fabrics and runs off the smooth fabric and hence dries quickly. This property makes the nylon fabrics suitable for raincoats and shower curtains. Nylon’s low absorbency has a disadvantage in that the fabric feels clammy and uncomfortable in warm, humid weather. Cleanliness and Washability: Nylon fabrics are easy care garments. Nylon fabrics are smooth, non-absorbent and dry quickly. Dirt doesn’t cling to this smooth fibre, which can be washed easily or can be even cleaned by using a damp cloth. Nylon whites are commonly referred as colour scavengers and should be washed separately to avoid greying. They easily pick up colour and dirt from the wash water. Nylons, washed with other fabrics pick up colour (even from the palest pastels) and develop a dingy grey appearance that is extremely difficult to remove. In addition to retaining their appearance during wear, garments made from nylon fabrics retain their appearance and shape after washing. Hot water should be avoided during washing as the hot water may cause wrinkling in some fabric constructions. Effect of Bleaches: The nylon fabrics are white and generally do not require bleaching. The nylon fabrics which pick up colour or develop greying should be bleached with oxidising bleaches such as hydrogen peroxide. Shrinkage: Nylon fabrics retain their shape and appearance after washing. It has good stability and does not shrink. Effect of Heat: Nylon should always be ironed at low temperatures. Using hot iron will result in glazing and then melting of the fabric. Effect of Light: Nylon fabrics have low resistance to sun light. They are not suitable for curtains or draperies as it is weakened by the exposure to sun light. Resistance to Mildew: Nylon fabrics have absolute resistance to the development of mildew. Resistance to Insects: Nylon is resistance to the moths and fungi. Reaction to Alkalis: Nylon has excellent resistance to alkali's but the frequent and prolonged exposures to alkalis will weaken the nylon fabrics. Reaction to Acids: Nylon is less resilient to the action of acids and is damaged by strong acids. Affinity for Dyes: Nylon can be easily dyed with a wider range of dyes. The dyed fabrics retain their colour and have good resistance to fading. Resistance to Perspiration: Nylon fabrics are resistant to perspiration.